Metallic materials have attracted the interest from a wide research community including materials scientists, materials engineers, biologists and medical doctors for their use in the biomedical area. Some alloy compositions are already in use in the market but suffer from several shortcomings. For this reason, novel, optimized, non-toxic, biocompatible compositions are being continuously devised. 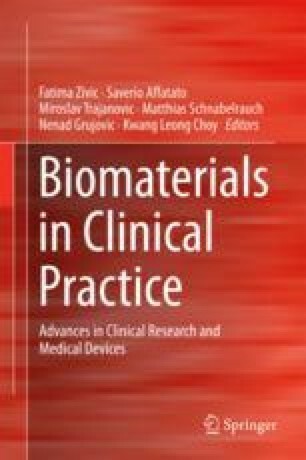 This chapter first reviews and discusses the advantages of bulk metallic glasses (BMGs) for orthopaedic applications, with special emphasis on their mechanical properties. Examples of newly developed permanent Ti-based and biodegradable Mg-based materials are given. In the second part of this chapter, the surface engineering methods currently available to modify the surface of Ti alloys are discussed. The outermost material layer in contact with the surrounding tissue acts as the biointerface and, hence, if appropriately designed, it can provide enhanced mechanical and corrosion resistance to the bioimplant and prevent from ions leaching. Finally, the recent progress on the formation of nanostructured titania coatings by hydrothermal treatment on the surface of Ti-based alloys is analysed. Financial support from the WIMB 543989-TEMPUS-1-2013-1-ES-TEMPUS-JPHES project from Education, Audiovisual and Culture Executive Agency (European Commission) is greatly acknowledged. E.P., J.F., M.D.B. and J.S. are also grateful to the 2014-SGR-1015 project from D.G.U. Catalunya. E.P. and J.S. ﻿acknowledge the Spanish Ministerio de Economía y Competitividad (MINECO) for the Ramon y Cajal contract (RYC-2012-10839) and the Juan de la Cierva fellowship (IJCI-2015-27030﻿)﻿.